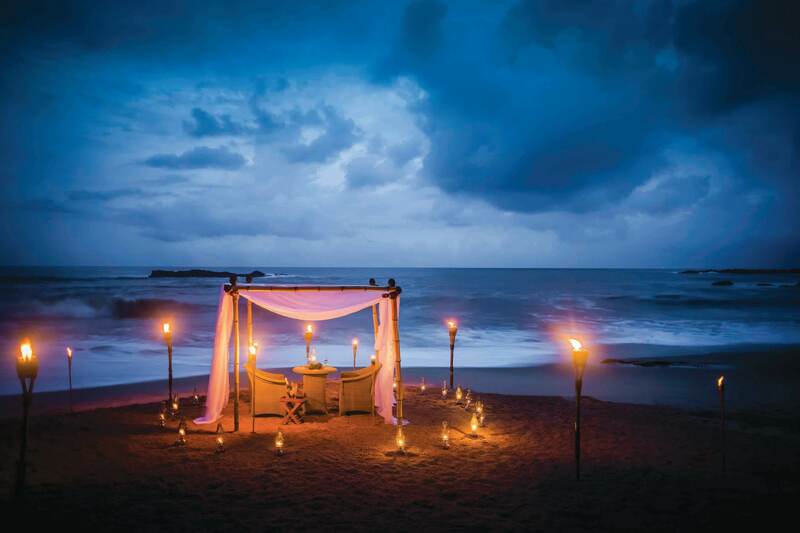 If it’s your first visit to Sri Lanka, the Cinnamon Air seaplane flight into Tangalle from Colombo’s Bandaranaike International Airport provides a spectacular bird’s eye view of rich terrain, a tapestry of sprawling tea fields where lush greenery transitions into the jagged coastline in the Southeast. The smooth-as-silk water landing was a dream and the final destination just 10 minutes away. 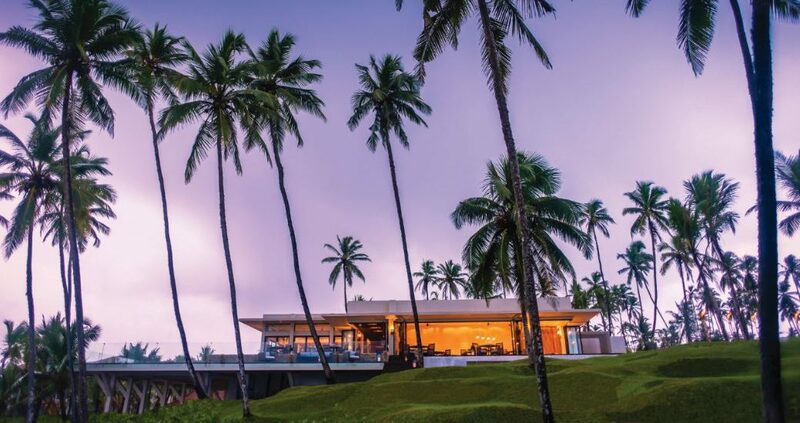 Located on a secluded stretch amidst a coconut plantation is the 21-acre Anantara Peace Haven Tangalle Resort, an exclusive retreat with gorgeous views of the Indian Ocean. Whether you wish to explore the town’s fishing port or sandy beaches, discover temples or embark on a whale-watching excursion, it’s an ideal base for any adventure. Take time to enjoy the laidback pace of Sri Lanka, and your new luxurious surroundings, with a lazy lunch served in your villa. The beach variety are generous in size at 64sqm, complete with wine humidor, rain showers and a roomy terrace. 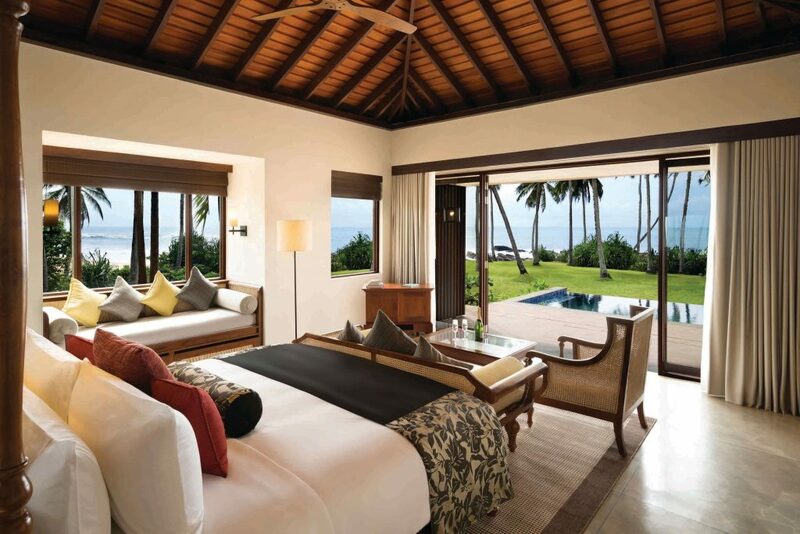 There’s little need to leave with your personal plunge pool and the sun-kissed shores at your doorstep. Unwinding completely calls for a spa visit. The Anantara Signature Massage stimulates circulation while calming and restoring the flow of energy along the meridian lines. Prior to the treatment, their in-house Ayurvedic doctor recommends using the time as a meditation, rather than an excuse nap, and focus on areas of stress requiring extra attention, for a more mindful experience. Despite selecting the most invigorating oil blend, it was still challenging not to drift into slumber, but savouring each expert stroke was a delight. Blissed out, I head to Il Mare for a sundowner, an Italian eatery perched on the cliff’s edge. Sit outside so you really take in the elements, crashing waves and warm breeze whipping through the night are all the background soundtrack you’ll need. Order the lobster linguine featuring a serious hunk of crustacean and save room for the deconstructed tiramisu. Get to bed early for an exciting day of wildlife ahead. A wake-up call at 4.30am gives you enough time to roll out of bed and scramble together essentials before pick-up in the lobby at 5am for the 90-minute drive to Yala National Park, Sri Lanka’s second largest and most visited. Originally a hunting ground under British rule, it was transformed into a wildlife sanctuary and designated as a national park in 1938. Its nearly 130,000 hectares of forest, scrubs, grassland and lagoons are home to more than 215 birds, and 44 animal species, including its elusive leopards. We were lucky enough to see one napping deep within a thicket, in addition to elephants, monkeys, deer, wild boars, crocodiles and mongoose scurrying around after one another. It was slightly hectic with a traffic jam of 4X4s lined up bumper to bumper, queuing for photo opportunities. But thankfully a picnic basket filled with chocolate muffins, croissants and banana bread kept us occupied while waiting for the action to unfold. Observing the animals in their natural habitat is a joy and birdwatchers in particular are in for a treat with pelicans, jungle fowl, black-headed ibis, crested serpent eagles, kingfishers and fantailed peacocks going about their day merely metres away. Seven species native to Sri Lanka can be found here, and as such Yala National Park is deemed one of the country’s 70 Important Bird Areas. The plus side of waking before sunrise means there’s plenty of time left to indulge at the resort. After a leisurely lunch at the Pool Bar, and a quick dip as respite from the scorching sun, it’s time for more R&R at Anantara Spa. The Quench Hydration Facial uses Thémaé products and is a great way to revive tired, dull skin after travel. Combining facial techniques with shiatsu, the focus is on restoring moisture and relaxation. There was no chance of staying awake this time. A leisurely afternoon at the resort often involves a sweet treat at The Lobby Lounge tea complete with traditional Ceylon tea and a mammoth slab of chocolate cake. Calories don’t count on holiday, which is handy as the next thing on the itinerary is an enticing spread at Journeys. Tonight’s theme is ‘Continental’, but there is always a selection of local staples; the Sri Lankan fish stew, okra and long bean curries are a must. The desserts range from chocolate mousse to brownies and New York cheesecake, and are too tempting to pass up. But the indulgence doesn’t stop there. 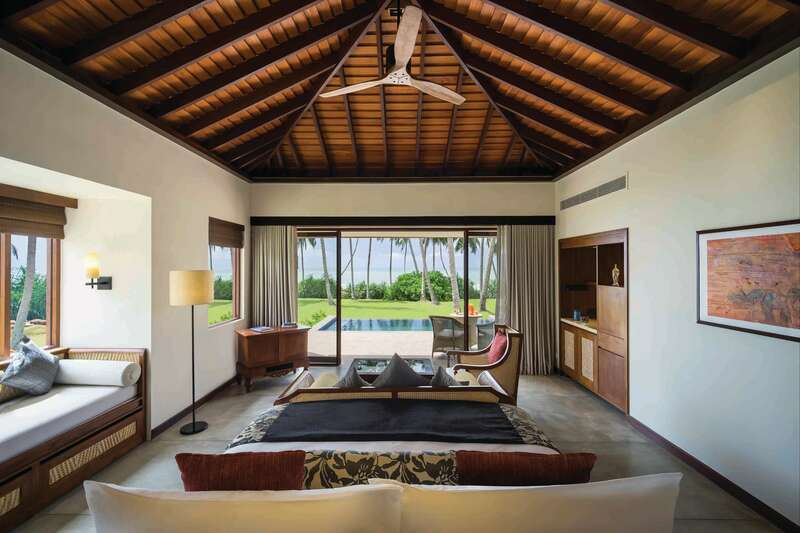 The spa highlight of the trip is the In-Room Slumber Guru Experience, where a dedicated team creates a serene ambience in your villa with tranquil music and an aromatherapy burner. Starting with a back, neck and shoulder massage using lavender oil, and ending with a spine-tingling head massage, you’re led to a milky candlelit bathtub overflowing with delicate pink petals while the wind and waves roar outside. It’s like the comfort of being tucked into bed as a child – only a million times more luxurious. After a delicious breakfast at Journeys, where I discover delectable local egg hoppers served with a chilli sambal, coconut chutney and sweet anchovy paste, I have a final treatment at Anantara Spa to look forward to. The 90-minute Marma Abhyanga focuses on junctions in the body where blood, lymph vessels, muscle, bone tissue and nerves meet. They are stimulated from head-to-toe using rhythm and pressure to restore balance and health. Reluctant as I am to leave this glorious haven, especially its warm and welcoming staff, I’ve heard wonderful things about Galle and look forward to taking a different route back to Colombo with a scenic drive along the coast. It’s a completely different experience from the flight over, which showcased mostly undulating green hills. The journey is filled with fascinating snippets of rural life and weathered shoreline, its raw natural appeal a refreshing change from pristine postcard-worthy beauty. After two hours watching fisherman perched precariously on stilts, and couples huddled under umbrellas taking shelter from the wind, we reach Galle (yet another exquisite picnic basket devoured en route) and cram in three hours of hungry exploration. The historic town is everything I had hoped it would be, with its striking colonial fort juxtaposed with a dramatic coast battered by waves as palm trees dance frenzied.